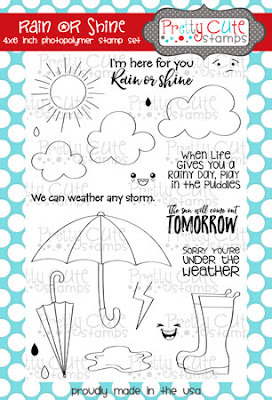 Karla Yungwirth Designs: Pretty Cute Stamps - The Sun Will Come Out Tomorrow! Love this card for the first day of Spring! The umbrellas are adorable and I love the way you popped up the layers! Thanks for sharing with us at DL.ART Challenges! Your card is lovely. The soft colors make you thing of spring and the spring showers that come with this time of year. Great card! Stunning card. Love the inside. Thanks you so much for joining our challenge at Crafty Hazelnut's.